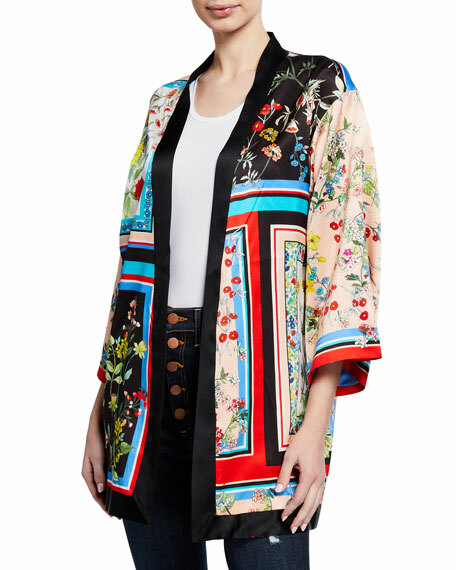 Alice + Olivia "Koko" patchwork-printed kimono. Open front. Three quarter sleeves. Relaxed silhouette. Straight hem. Cotton/spandex, shell. Viscose/nylon/spandex, combo. Nylon/polyester/spandex, lining. Imported. Kiki De Montparnasse "Amour" robe with contrast piping. Shawl collar; open front. Half sleeves. Self-tie sash at waist. Relaxed silhouette. Straight hem. Silk. Made in USA of imported material. Lise Charmel "Nuit Elegance" nightie in solid stretch-knit. Scoop neckline; crisscross back. Thin, adjustable shoulder straps. Embroidered mesh bust. Empire waist. Straight hem. Polyester/nylon/spandex. Made in Bulgaria.